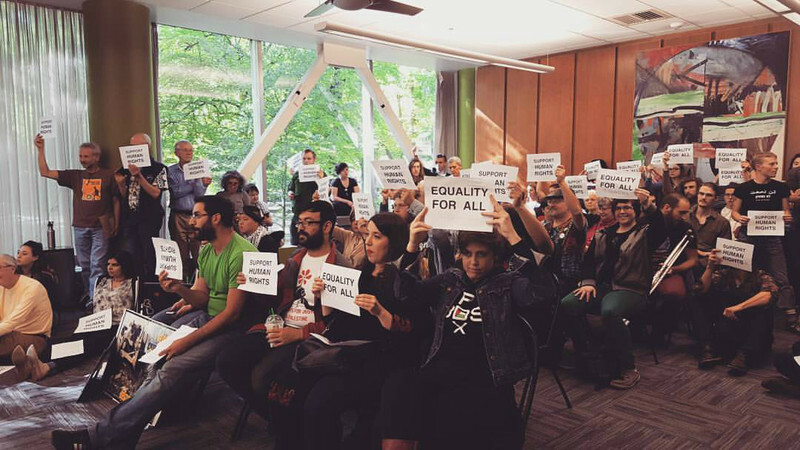 Portland, OR (October 26, 2016)— The student senate of the Associated Students of Portland State University (ASPSU) passed a resolution earlier this week brought forward by Students United for Palestinian Equal Rights (SUPER). The resolution calls on the university to divest from Israeli apartheid by an overwhelming vote of 22-2, with 1 abstention. The resolution was passed after seven years of work by SUPER, which presented to the student senate. The central focus of the resolution is to prohibit investment in four corporations complicit in the oppression of Palestinians: Hewlett-Packard, Motorola Solutions, G4S and Caterpillar. Hewlett-Packard provides biometric ID systems to the Israeli military that enables discriminatory treatment of Palestinians, playing a similar role that Polaroid did in apartheid South Africa. Motorola provides surveillance and communication systems supporting Israel’s occupation and illegal settlements. G4Sprovides systems and support for Israel’s imprisonment of political prisoners and children under unjust military rule. Caterpillar provides militarized bulldozers, which are complicit with numerous human rights violations and are used to destroy Palestinian homes, orchards, and civilian infrastructure. We believe in justice and equality for all people, and are proud that our campus is now on the right side of history. We hope our university’s decision may encourage others to also stand for human rights. We urge other members of the university community and other universities to pursue the same path of justice, and to continue to make history towards a free Palestine.